Happy World Ocean's Day everyone! Today we're also kicking off the G7 summit following World Environment Day whose theme was Beat Plastic Pollution. Plastic pollution has really been in the spotlight, and I'm loving it! I have been able to connect with so many people through the National Geographic article that just came out. It can be really difficult to know where to start when it comes to breaking up with plastic. I wanted to give you my top five tips for phasing it out of your life. When you really start to see all of the plastic, you can't un-see it. Plastic is EVERYWHERE. It seems like you'll never be able to escape it, but I promise with a little bit of patience you will. It just takes time. Don't feel like you have to do everything RIGHT NOW. It's ok to be patient. No one goes zero waste or plastic free overnight. Go slowly and start with what you can. I recommend starting with the big four. These four simple swaps happen outside of the home. This way you can focus on using up what you have inside of the home before moving on. It's completely contradictory to the zero waste lifestyle to throw everything out and upgrade to new eco-friendly products. I wrote a post about what to do with old plastic when you're plastic free, which will be really helpful when making the transition. I think you'll be surprised with how many disposable and plastic items you own when you really take the time to go through your cabinets and drawers. If something is in good shape and can be donated and you don't want it anymore, donate it or list it on a freecycle group, craigslist, or the facebook market place. 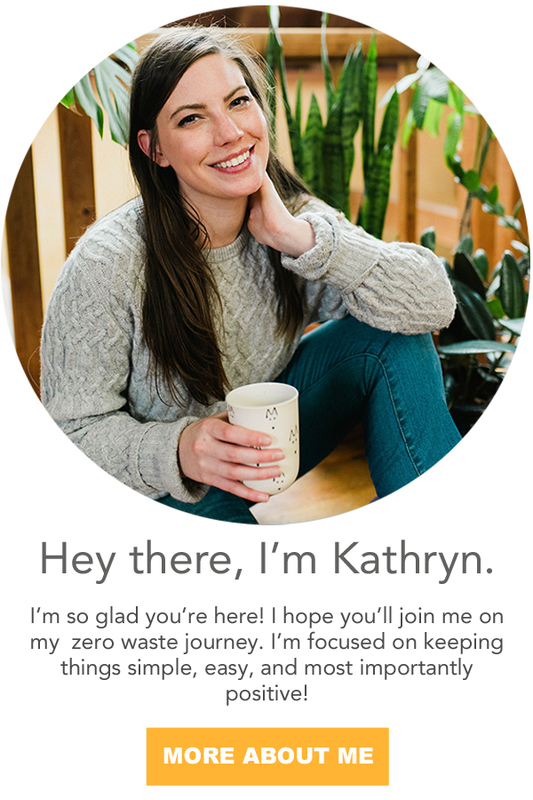 Going zero waste is just as much about adding new products into the second hand market for others to use. This prevents new resources from being used in the creation of new products. 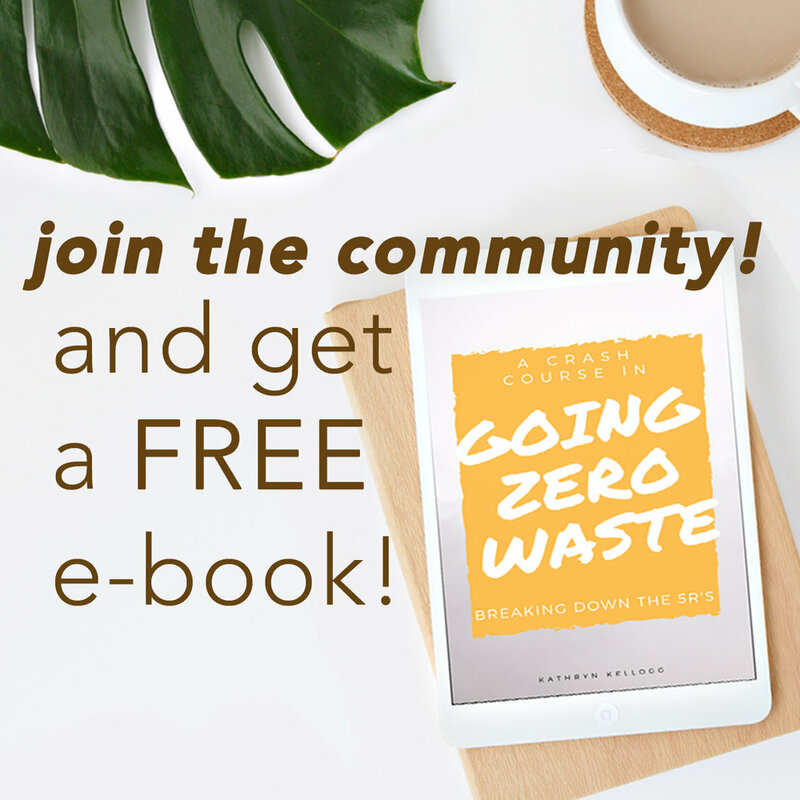 You can read this post about decluttering the zero waste way which goes more in depth on this topic. For products that aren't suitable for donation. Perhaps cosmetics and food in packaging that has been opened. Use it up! Don't automatically run out for zero waste counterparts. To be honest, I still have some makeup I'm using from my pre-zero waste days! (PZWD) It's OK.
Use up what you have and then move on, when you're done. If you're uncomfortable with some of the ingredients in these products, see if you can pass them off to a family member or friend only if they would buy that product anyway. Sometimes, it's nice to have disposable things for certain special circumstances. I still have a couple of plastic razors from my PZWD. You can't take a metal safety razor with you on a plane. If I'm traveling, I pull out one of those razors. I still have trash bags from my PZWD! I keep them for neighborhood and beach clean-ups. These are resources I bought long before I knew about zero waste, but there's no reason I should throw them out. At the same time, you also don't want the temptation to reach for these items especially when you're just starting on your zero waste journey. Take these items and put them in a hard to reach place. This will discourage you from reaching for them, but they'll still be accessible for these unusual life events. I'm not going to lie to you, companies make a lot of really cute plastic stuff. There are a lot of great products packaged in plastic. Whenever I find myself tempted, I like to remind myself that plastic is toxic. It isn't just bad for our health it's also bad for the health of our planet. If I have the choice, I don't want to buy my food surrounded in plastic. The plastic can leach chemicals into the food. I don't want to sleep on a toxic, plastic mattress. There are so many examples of products that I try to avoid beyond the environmental reasons, it's really just better for our health. If you're struggling with breaking free from plastic, find something that's a treat for you! One of the great bonuses of living plastic free and having a pantry sans labels is that things become very aesthetically pleasing. While consumerism isn't the point of zero waste living, buying something you're super excited about using can be really helpful! Maybe you've just had your eye on a set of Weck jars, glass straws, or an awesome canvas bag. Go for it! Splurge a little if it will help you reduce overall. While it's always best to shop the second hand market first, sometimes throwing in a little bit shiny and new can help you get really excited all over again! Going plastic free and zero waste is a journey that will never be complete. The bottom line is do the best you can. In order to reduce your waste, you have to know what you're throwing away. Know thy enemy is like... rule number one. Trash/waste, you are the enemy, and we will vanquish you! So, that might be a tad dramatic, but other than starting with The Big Four and buying less, performing a trash audit is a great step for beginners. It's a really simple process, I promise. I'm currently wondering how I'm going to get a full 1,000 word blog post out of it without resorting to more battle analogies, but for your sake - I'll spare you. You're going to an immediate and noticeable difference. We love instant gratification. Your trash probably changes from week to week. Keep checking in on your trash and recycling to see where you can easily improve.